I managed to print a 20mm calibration cube using some ABS filament other than what was sent with the machine. The part came out with some interesting defects (the side walls showed definite herringbone patterns, suggesting insufficient drive to the extruder motor) however the X and Y accuracy was pretty good. But as I unloaded the filament at the end of the job, it was obvious that I too now had the “loose screw” in the drive wheel problem. Fixing that is not difficult – take the plastic cover off and the left side of the extruder body using the two thumbscrews. Then take the fan on the right side off and it will uncover some slits where you can easily insert a 1.5mm allen wrench. Of course you’ll have to get the drive wheel in the correct place on the stepper motor shaft, as well as the proper front spacing. Pictures coming soon. Note also Solidoodle released an update (1.1.1 now) to the client software on 2/12 or so) – it fixes some issues reported so far. 1. Remove (and discard!) 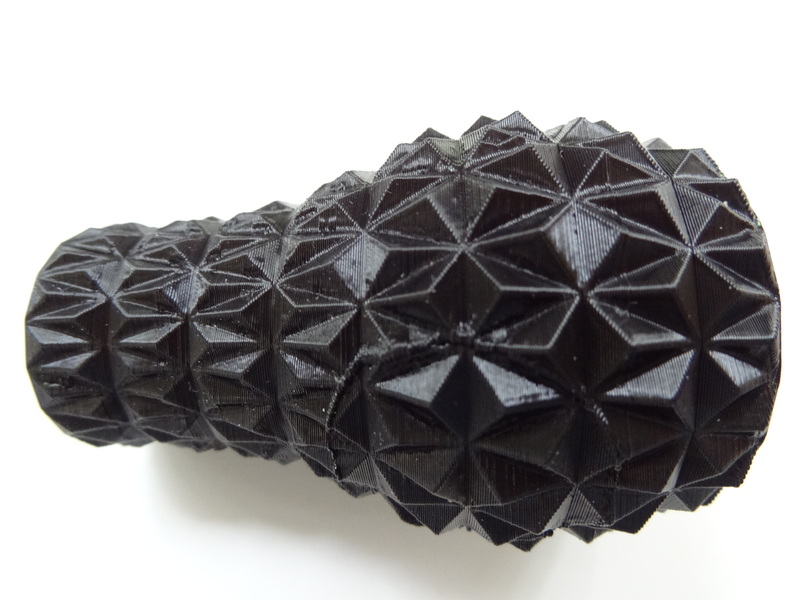 the factory supplied black cable loom piece – if it is like mine, it is too stiff, too large, and too big in diameter. It just gets in the way. 2. 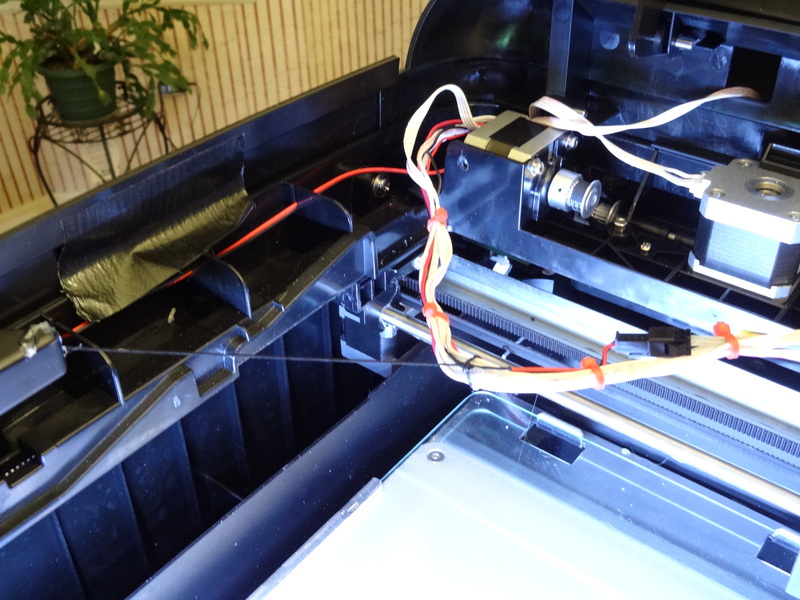 Use a tywrap to fix the cable bundle at the head to the top side of the extruder motor. I also used some hot melt glue as an enhancement. The wires should come off of the left side of the head, low and with enough give for the Z probe to move. 3. 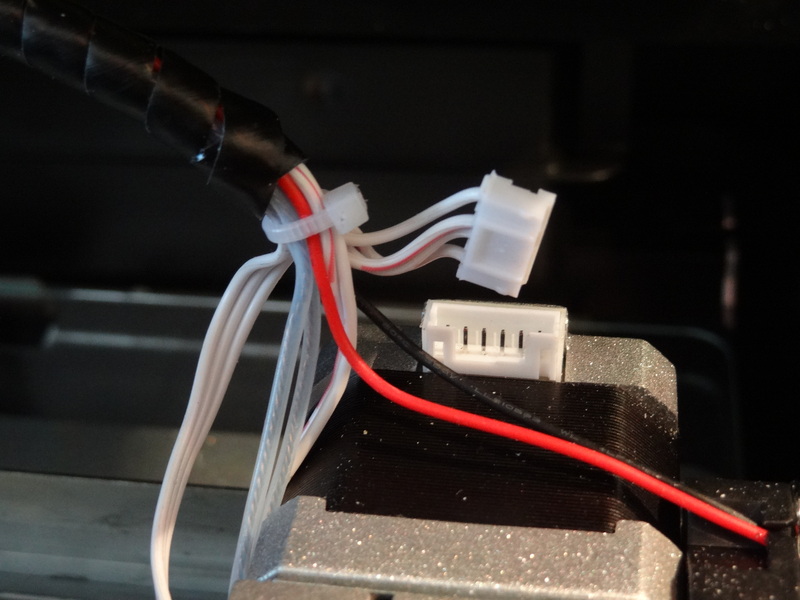 Use some tywraps to make the cable bundle secure along its length back to where the wires enter the chassis. 3. Fix an elastic string (I got some at a fabric shop) to the cable bundle about midway, and hot melt glue it there and to the front left corner of the chassis. There will be some need for experimentation for the best “preload.” What this does is keep the cable assembly tensioned so that it remains relatively suspended no matter where the head is positioned. 4. 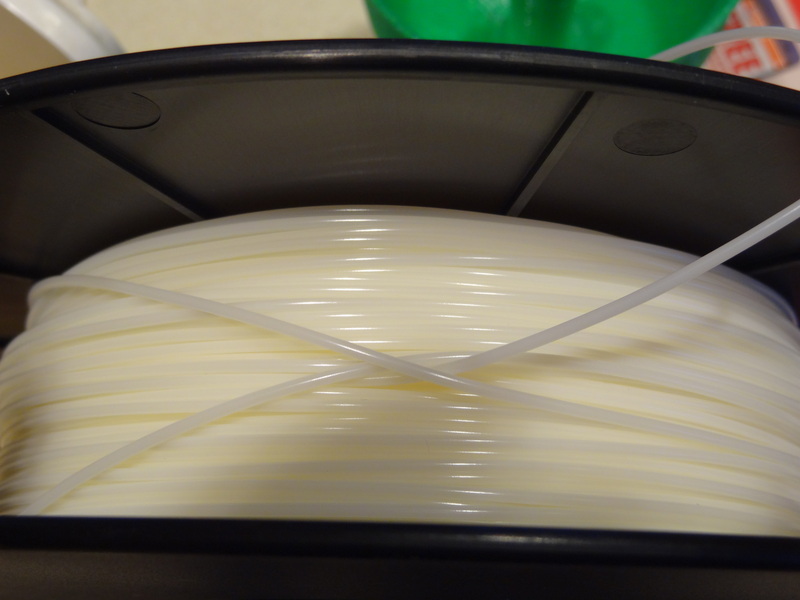 Finally, use 1/4″ plastic spiral wrap (I tried 1/8″ and it is too tight) to cover the entire length of the cable. If I can only get my regular day job of late done, I’ll be able to get to this fun stuff! 😉 And a new post with video will be there soon. This works fairly well so far but I remain convinced it is just an interim solution — something better is needed for the long term. Solidoodle Press – epic fail! To test this new machine, I used a “trivase” model which is fairly good for finding faults in sidewall consistency and Z wobble problems. Because my first test model didn’t stick very well to the build plate, I used a thin coating of 3D Systems Cube(tm) Magic glue – this stuff is nearly clear and is not PVA like Elmers but still is water soluble. After hairspray and Kapton tape, this is my favorite bed stick materal. I let the machine run overnight. 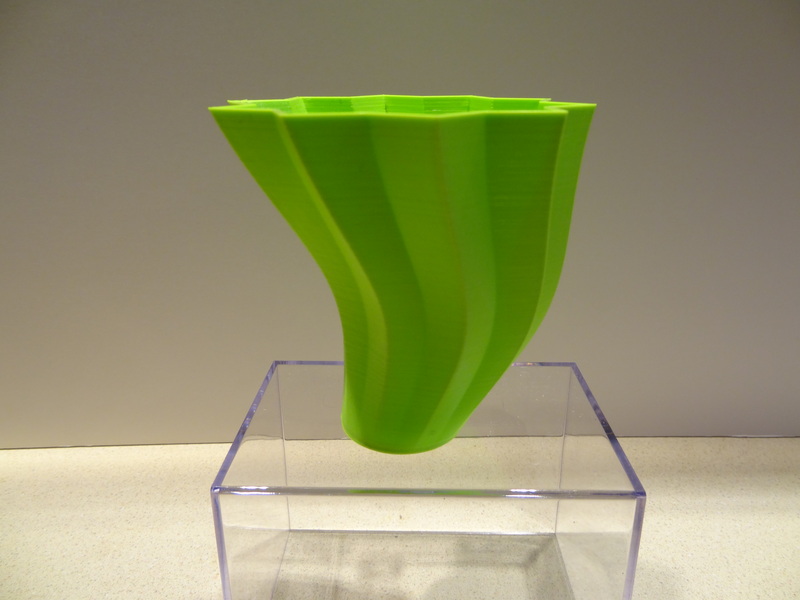 Next morning, though the job was “done,” this is what I saw in the machine – a partially completed vase. What happened? Turns out, I had a filament tangle in the spool. 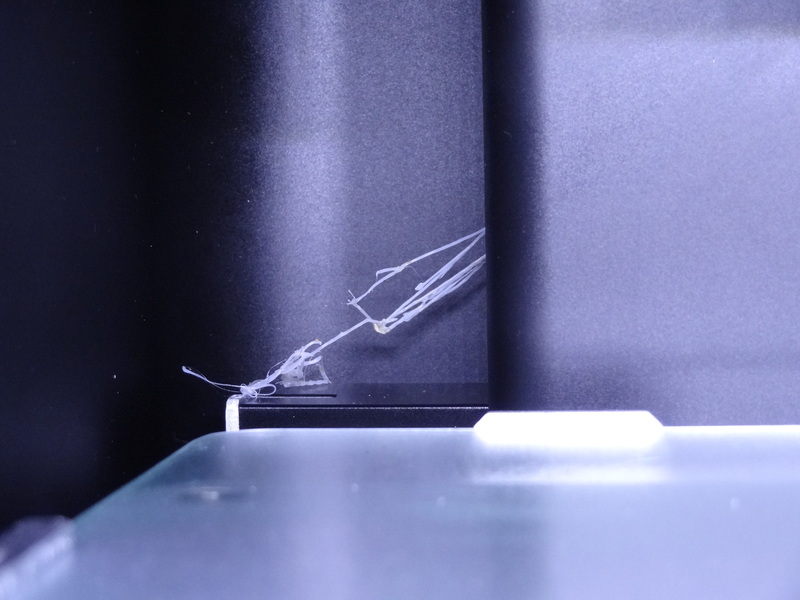 This is that tangle… and the filament had snapped inside the machine, running out as it kept trying to build – an airprint of sorts. I detangled this mess, reloaded the filament and then tried to start another job. But something was not right. The extruder would work at the front of the machine, but not the back? Bed leveling issue??? I thought the Z probe autolevel was supposed to fix this (more on that later). However, as I went to check the Z height offset things were not working like it had originally. The extruder motor was making weird noises. No, this was not a filament jam! While you can’t see it, what happened was the wiring in the extruder motor connector had been compromised by the stress at that connector and the movement of the umbilical cord. There is no strain relief here. Look closely at the distance between the nylon wire wrap and the motor connector – that is how it is built. So as the head moves, the wires are getting bent and stressed, and the result is a broken connection. I could actually see a tiny spark in the end of the motor connector on the left-most wire where it is attached to the crimped terminal. While you can see I’ve changed out the larger plastic cable cover with flexible spiral wrap, the issue will come no matter what you do here – the attachment point and movement of the head will break these wires sooner or later. My 12 hour overnight run definitely found this weakness. I’m going to reattach the connector and figure out some added strain relief bracket to keep the umbilical cord from tugging on that part. One last thing – the XY gantry has NO metal bearings. Just plastic on the metal rods – plenty of grease – but this design was not meant for the long term. Maybe OK at $349 but at $599 there are better built machines. 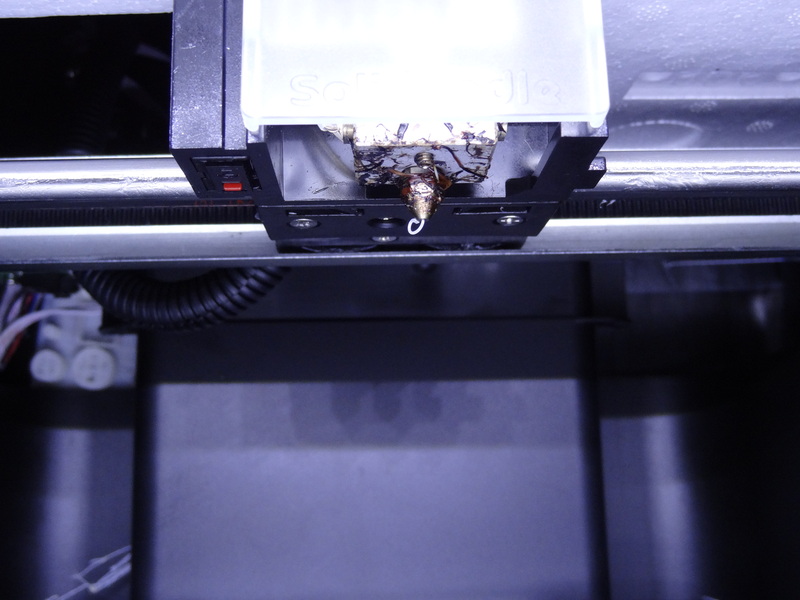 I will say the extruder is a huge step forward – easy to clean for one. 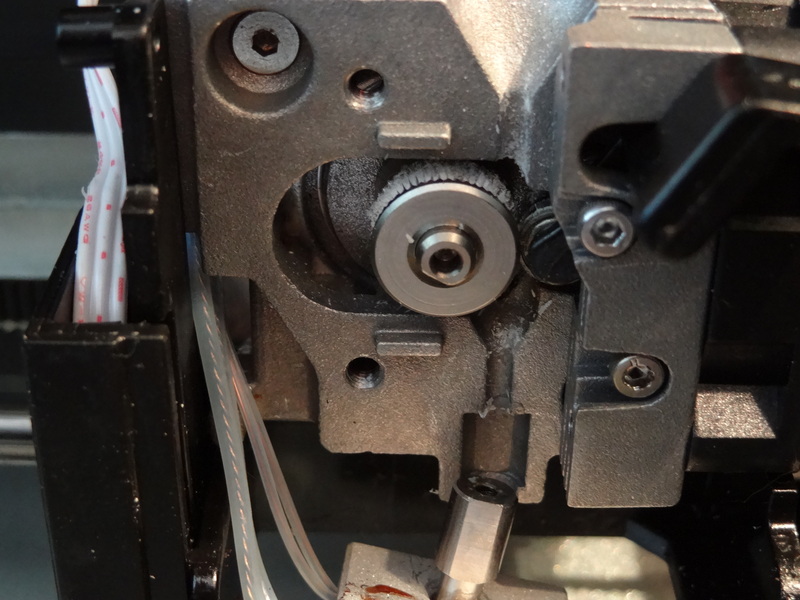 The shroud comes off, and another thumbscrew removes the half-plate on the left – the result is this: You can access the drive wheel and the lower part easily, and the extruder falls free of the drive block. Do be careful! I did this while it was hot to insure that I could get rid of any melted plastic along the way. This design is remarkably clean and should perform well. It also appears that this extruder will work with the TEM materials like Ninjaflex(tm) but that remains a test for another day. And one other positive thing – the Z axis screw appears to be an Acme thread instead of the classic threaded rod approach, but I need to do some digging into the machine to confirm that. Thanks to the Z probe report, I do know that my bed is more than 2mm lower in the front than the back – I plan to investigate that too. More to come as I work with this machine. UPDATE: Some have asked if this machine has a cabinet filter and fan, and its amazing – it does! It appears to have a carbon activated filter mesh, but I’ll need to dig deeper into the box. I have it almost completely disassembled at this point, figuring I might as well do a thorough internal inspection while looking for useful enhancements. One is the insulation on the heat bed pad underneath; in checking it I found it already was coming loose from the corners. It is just glued on – so first I’m going to fix it with some Kapton tape at the edges. I also recentered it – the original installation was obviously hasty. UPDATE 2: The machine is now fully repaired and ready to go. I added the heated bed insulation underside, repaired the motor connector wiring, added some strain relief and reworked the layout of the umbilical cord to the head. One additional idea I had was to put a pad of ceramic wool insulation between the top of the head block and the extruder – keeping some radiated heat from getting to the upper section. As I’ve only used the factory supplied ABS for now, I need to try some other filament and see how it goes. As soon as I get more results I’ll post them here. Well, it finally came. The box was in decent shape, despite its long journey from China. I will not post unboxing pics simply because there are plenty of others out there already, though I’m in the first wave (batch of 200) that were shipped to consumers. Thankfully I had the benefit of several others that got theirs Tuesday or Wednesday this week and posted their trials and tribulations. The interesting thing about mine was like the old “prize in the Cracker Jack box.” You knew there was one in there, but where? Yes, my Press had a special “prize” inside all the way from China! As I unpacked it, I noticed a bit of tangled extruded filament at the left rear corner of the build envelope. But as I went to extract this obviously extraneous stuff, I heard a noise of like a piece of plastic dropping inside the machine. Well, it turned out that they left the test print inside the machine, and with shipping, it became dislodged. Trust me, it wasn’t easy getting it out – I had to turn the machine upside down and gently shake it. Unlike the SD2/3/4 Brooklyn machines, this one is full of shrouds and panels to hide much of the mechanics. The picture to the left is when it was upside down – figured it would be interesting to show how the heated bed is constructed – and look mom, no insulation on the lower side. That is something I plan on fixing soon. Yes mine also had a messy extruder block, apparently from burn in and testing. You’d think a small QC step would be to brush off the deposits before cooling down and packing it for shipping. As for the Solipress software, it is as advertised – minimal control. One thing it needs (besides getting the 10 or so posted bugs fixed) get a more obvious manual axis control. You can send it G code – it is in the “printer options” panel. My first build warped off the plate (just using it as received – time to get some AquaNet hairspray). But when I stopped the build, the Z stage just sat there. How do you get it to move downward to some usable depth so that you can access and clean the build plate? And, there is no option to create a raft in the slic3r configuration (but you can turn on supports!). Given the delays in getting this machine to buyers, I’d think the software would have been fairly polished and debugged long ago. UPDATE #1: The nasty Y homing problem is actually a design flaw. Using Repetier and manually sending some simple G code (M119 – report endstop status) I was able to confirm that the issue is not the endstops. They are working just fine. The problem is the large diameter cable cover to the head – it falls down behind the head and gets in the way of the gantry as it moves back to the rear where the Y limit switch is located. The cable cover is really too stiff and large and just doesn’t stay up in the top of the chassis. My plan is to replace it with some smaller diameter cable spiral, and fix one end of it at the rear so it stays out of the way when the gantry moves to the endstop. This will definitely fix it. I can move the gantry manually to the endstop so long as there isn’t the obstruction from the head cable. I’ll update this when I have the fix in place to show you how I did it. Also, the Z “home” is actually the Z probe, so homing in the normal sense can’t be done unless the probe is deployed before doing the homing of the Z axis. If you don’t, crash! The Z motor will just keep driving the platen into the extruder tip and that is not good! So some thought to how you home the Z is in order before using some other software like Repetier (though Solidoodle has released a Repetier customization that includes the new Press). So how did things turn out? There were definitely successes and failures, as one would expect. As for failures, MakiBox was one. I was fortunate to have an early order that was fulfilled, but many were left with nothing for their $250 investment. The manufacturing quality was fairly good, the instructions “Ikea” like, but the cartesian XY system was a bad design and subject to binding or too much “slop.” I’ve not build anything with it yet, but it does respond to Repetier and should work if I ever chose to. However, it is in desperate need of a revision to the XY axes system. MakerBot had tons of problems with their “Smart Extruder” system, continuing to revise it all year long. I think the latest generation of extruders are doing better – I’m on my third one for a Mini. Software has gotten more stable and generally works as planned. However, the Mini and 5th Generation machines are simply overpriced (as is their scanner) compared to other units. What will they show next month in Las Vegas (the Winter CES)? Will there be a 6th generation that actually works reliably and allows for an ever wider array of filament options? 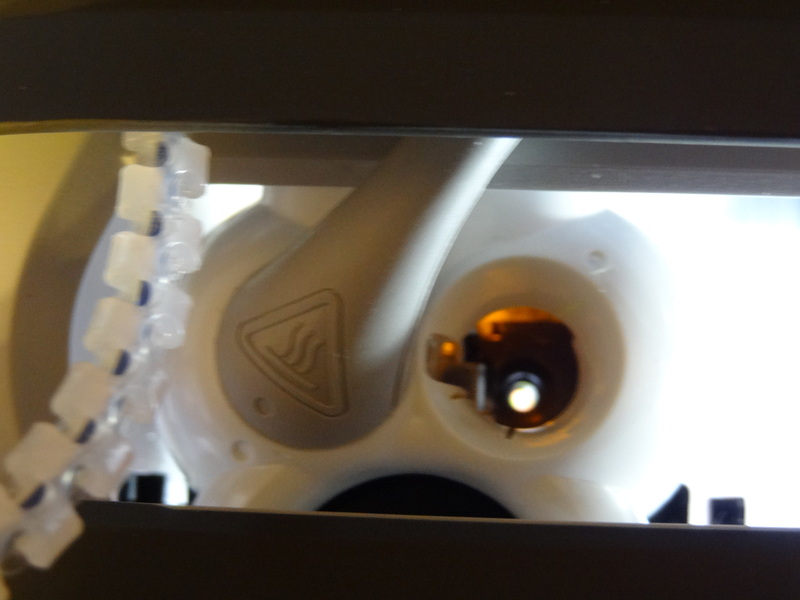 DaVinci released their dual nozzle unit and the AIO – a single nozzle machine with an integral scanner. Blog reports for the AIO suggest the scanner is not much use. In fact, speaking of scanners, the MakerBot scanner isn’t of much use either – I’ve tried numerous models and the results are rarely usable. DaVinci has tried to beat the cartridge refill option, although it is still possible to remain on a machine firmware level that will allow this – the web has plenty of hacks that work. A new touch screen interface for even the 1.0 unit will probably make all the current hacks obsolete, but don’t underestimate the cleverness of the technical folks out there. The promised release of the Nobel 1.0 SLA didn’t happen as far as I can see, so we will have to wait until next year. Update: release announced for 3d quarter 2015 at $1499 – which is pretty amazing. Phoenix3D is more or less dead. They have very poor reviews of their kits on several blogs. I’ve asked for a refund of my “deposit” from March 2014 and have not received it as of this writing. They raised their prices dramatically – probably to try and pay off their refund requests – but they are nowhere competitively. 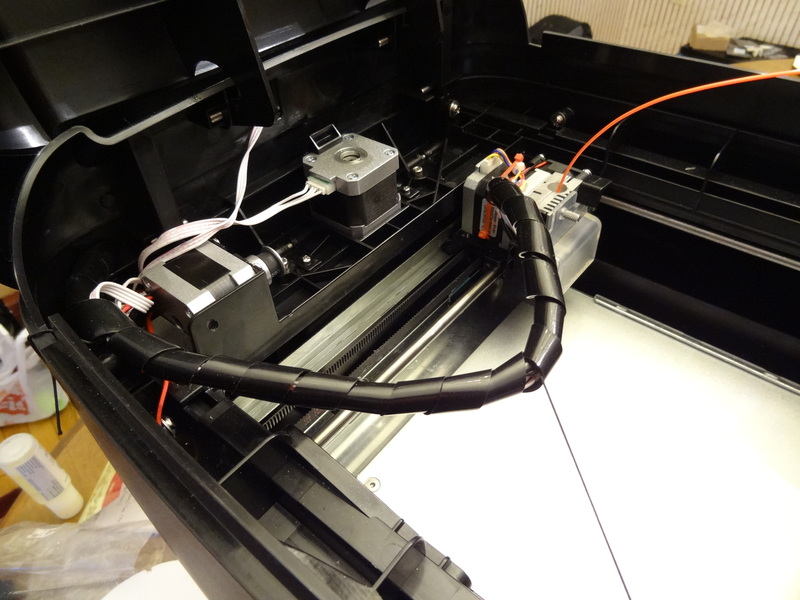 You can purchase a fully assembled and working Davinci or PrintrBot Simple for less. Zeepro ZIM continues to fulfill their Kickstarter rewards and also have begun to sell machines on Newegg, including filament supplies. My machine works but I had an early failure with filament backup around the nozzles – the machine crashed somehow but continued to extrude. I finally got this cleaned up. A replacement to the retaining hardware for the Bowden tubes was sent, but my Bowden tubes didn’t fit the new retaining fittings very well and I crushed them too much during reassembly. I purchased new tubing of a better fitting OD and the fit was perfect. I need to retry this machine again – there was at least one firmware update while it was down for repairs. It is very quiet, nicely built, but the main limitation seems to be the web-based interface. Wish they had gone with a Cubieboard 2 instead of the first-generation model for that part of the system. Running slic3r on that board is a bit of a challenge – yes, the ZIM has two CPU boards – a traditional RAMPS board adapted to that system, and a web-based server running on a Cubieboard. On mine at least I can run it on Repetier and it bypasses the internal server completely. CEL Robox continues to sell machines into the market, but mine had some issues early on. I actually have now built (or sort of built) some small parts but I would not declare this fixed and ready to go. There seems to be a Z gapping problem. What happens is this – you first go through the manual calibration process by using the software and a piece of paper to set the gap. Once completed, you reinstall the PEI build bed. Then before each print, the machine measures the Z gap by lowering the head into the plate until a limit switch is tripped. However, my results give a Z gap that is too low – despite confirming the gap as directed. 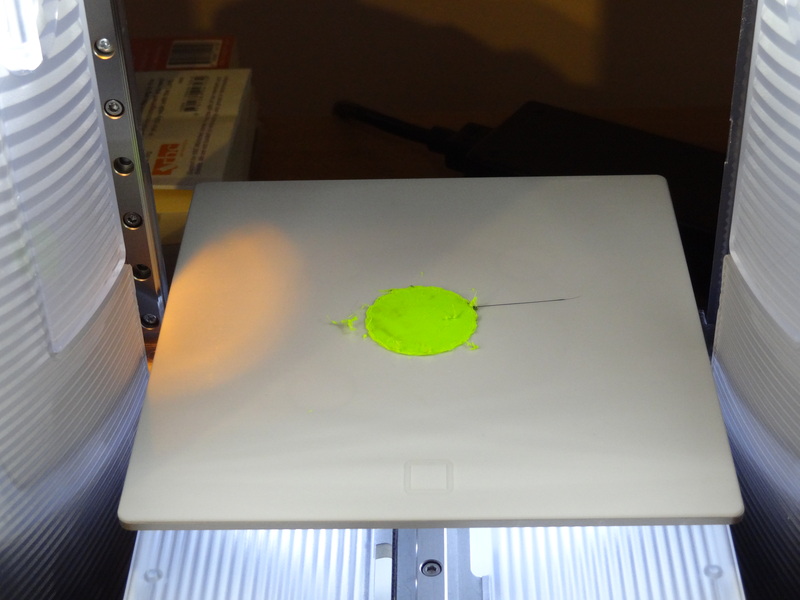 My first layer is smeared to the table and there are clicking noises from filament jamming – neither good. So I put in a support ticket over a week ago and so far nothing heard (yes, that includes Christmas but still…). They appear to have lost their best support tech and there has been little added to the FAQ section (and yes, my problem is not listed.) While this machine is very well made and has some wonderful features (the host software is actually one of the best I’ve seen), support is slow. Update: got a reply to the ticket on 1/8/15 and they posted a solution. Solidooodle refreshed their lineup this summer, and the surprise was a new “consumer” unit called the “Press.” Built in China instead of Brooklyn, the first buyers were offered different tiered pricing depending on quotas. Well, for some reason, I managed to snag the very first Press order at $349 (it is now $599). This was promised for fall delivery, but as usual, there were delays. And as of now, my Press is sitting on a container ship off the port of Long Beach, California, waiting to be unloaded. The Press even comes with a new software package that appears to be on the same interface level as the DaVinci machines – pretty bare bones but functional for first-time users – the market Solidoodle is trying to reach. Stay tuned. I’ll be getting a review out just as soon as it hits my workbench. This one could be the sleeper of 2015! As for 3D scanners, there were some interesting developments. 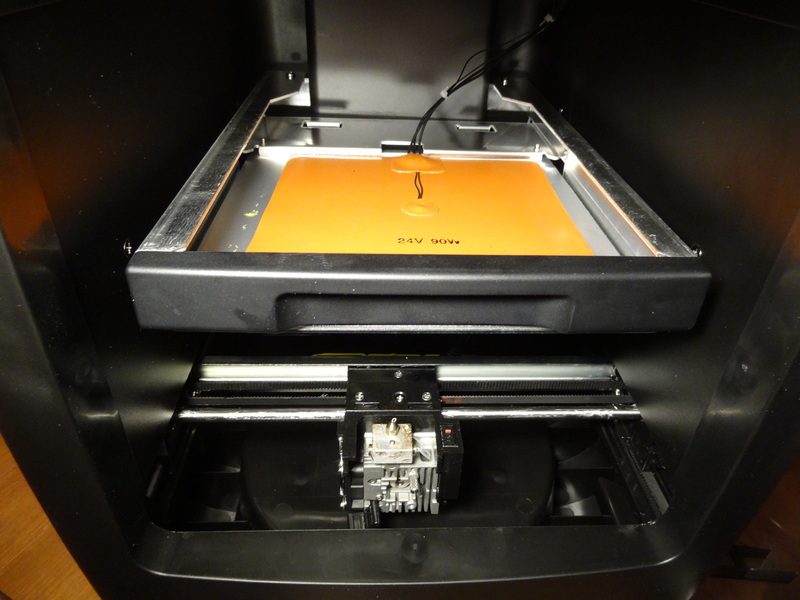 The MakerBot scanner should be completely avoided – it should be priced under $200 for all it does. The MatterandForm scanner has much more promise and the latest software release is definitely making a big difference. A few folks seem to have hardware problems, but my unit with the new software outperforms the MakerBot scanner by and far. As for the Rubicon unit, it is still “in production” but I expect that I should have mine sometime before March 2015. The software for it seems to be well developed, and I have tried some earlier editions (without a scanner, of course). But I did receive two other scanners – the Cubify Sense unit and the Occipital iPad add-on. Both work pretty well, but don’t expect sub-millimeter accuracy. So long as you are scanning modestly large objects (like people, statues, furniture, etc) you’ll get reasonable results. On the other hand, engineering scanning with these models is mostly out of the question (things like gears, mechanical parts to copy, etc.). I will be doing a comparison of these consumer offerings to some commercial scanners early next year. It was thought that 2014 would be the year of the liquid machine. So far, there has not been a huge outpouring of models, but there are some interesting developments. I predict that 2015 will see much more in the way of machines that are primarily consumer oriented. I built a SeeMe CNC “DropLit” as a beta tester – it works, although my main complaint is that there are too many light leaks and there is no lower shutter to shield the resin during idle times. A LittleRP kit is on its way to me as I write this. Both use DLP projectors to expose the resin, modified for close focus. I plan on using a closeup adapter lens instead of modifying my projector. A new “mini” SLA machine was announced on Kickstarter that uses a UV photodiode array for exposure. Although small, it most certainly provides a nice intro to the technology. And the Peachy Printer (another Kickstarter) continues to develop their hardware, but they are way over their initial delivery date. Hopefully that will be fixed in 2015! This gives you an idea of the size – it is not as deep as it is wide or tall – neatly sitting on a conventional computer desk. The lighting is bright as you can see, and the color touch screen control panel and power button are all the controls for the entire machine. Yet it has a larger build volume than the Cube 1 and 2 units at 6″ in x, y and z.
Cartridges mount on the sides of the unit. They snap in to the base and the nozzle locks into the head with a 60 degree spin. You can see the drive pin in the very center of the cartridge tray, and the socket on the cartridge itself. As far as I know, this is the first use of a remote extruder drive in a consumer 3D printer (the Stratasys Mojo was the first I think on the commercial side). This design feeds and forces the filament up from the cartridge to the head – there is no motor or other drive at the nozzle end. While the pathway is short and the tube sealed, this design has some potential issues – but on the plus side you get a new extruder drive and nozzle with each cartridge. The motor for the filament drive is inside the Cube. 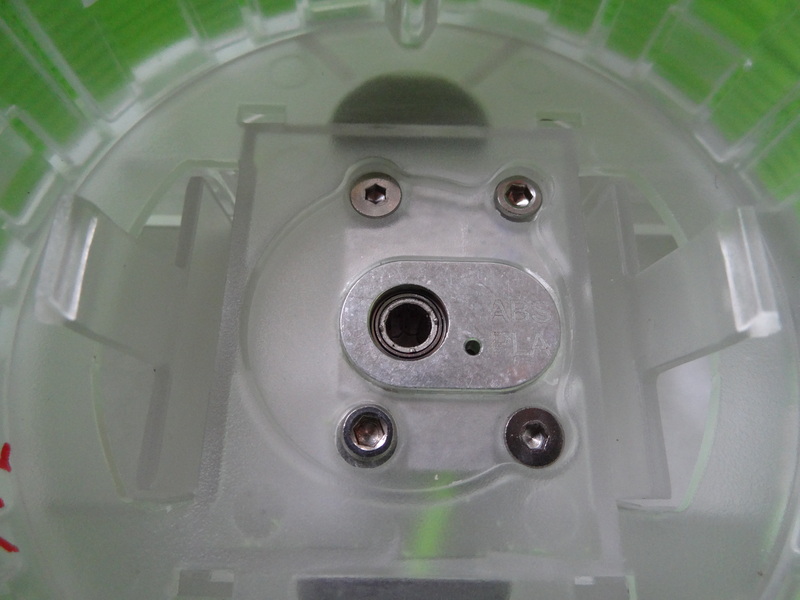 In the Cube 1 and 2 units, the head itself had the drive motor inside, and the filament was drawn from the cartridge. Yes, these cartridges, like the Cube 1 and 2, are chipped and proprietary, but unlike the opaque shells used earlier, the frosted clear plastic allows a quick visual on the remaining filament. 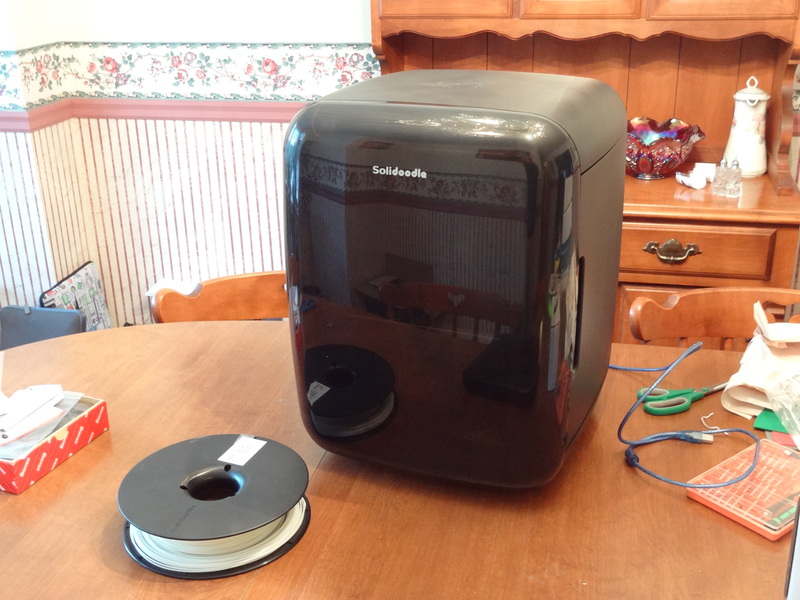 But I believe they contain as much or more filament than the old cartridges – approximately 500g is on the spool. And despite what must be a higher cost per cartridge shell, the price is the same as before. Setup was quick and easy. The touch screen leads you through with visuals and text to let you know what is next. The demo build is a small keychain fob and a cursive “Hi!” printed below it. So after getting things connected, I went on to do some builds of my own. The one I really wanted to try was the dual color faceted vase that is an included sample. So I took the plunge and set it up for green on the main part and black on the round side features (in my unit, the starter cartridges were neon green and black PLA). As I made it full size, the total estimated build time came to 36 hours at 70 micron layers. Things got off to a good start, but somewhere a few hours into the build the green cartridge stopped extruding. What I found was the machine “air printing” and some of the black that was part of the two-color build was now tossed around the machine (not having the green part printed to the layer where the black would take part in the build). The problem turned out to be the cartridge was jammed; I could see shards of green filament inside the center of the cartridge hub below the extruder drive. The black cartridge was perfectly fine. The picture above is how far it got before jamming, but you probably should not judge that build as the best because the cartridge was defective. However, after this was cleaned up, I printed a black only one in smaller size and in “Draft” mode. The results in this fastest mode with 200 micron layers is incredible. Yes I’m disappointed that my first build failed due to the green cartridge. However, a note to customer support got a fast response and a new cartridge is being sent to replace the defective one. The picture on the left is that build. I’m not sure I will use the 70 micron layer height much if the 200 micron builds are this good (and remember, this is the fastest setting!). The model here is about 3.5″ high. So am I pleased with this? Yes, while frustrating to get a bad cartridge out of the box new, the machine itself is lightyears ahead of the previous Cube generations. There are some things not easily spotted unless you look past covers and slots. For one, the internal chassis is CNC’d aluminum frames, not pressed steel as in the earlier Cubes. This makes the unit very light. Dovetail linear bearings are used for all three axes. While mine still makes a few squeaks and squawks, I suspect it will get quieter with use. The waste tanks are hidden in each side but easily removed to empty. The build plate is a plastic coated aluminum plate with embedded magnets to attach it. Be careful – they are strong – and not obvious where they are unless you see the mounting pad on the machine where they attach. There is a fan for the heater assembly in the head and a separate fan for cooling the part top layer. Both are hidden in the head, which is pretty small to begin with. Autoleveling and height adjustment are completely automatic and appear to use an optical sensor to determine the adjustments – but I need to investigate this further. So despite the cartridge problem, I’d highly recommend this unit for someone either new or experienced in 3D printing. And I’ll be doing more builds and examples soon with comparisons to commercial machines that cost many times more than this does. UPDATE: Based on early customer experiences, the firmware and calibration options have been improved to adjust for small, but important differences in the two nozzle heights. This change has greatly improved my results – one nozzle was slightly higher than the other, and if you used that nozzle to build, the slightly lower one would nudge the build layer and cause issues. As of late November, I’m waiting for new cartridges (which were listed as shipping on 11/25). I still have some material on my original black and green PLA cartridges, but without refills I’m going to have an idle machine. Cube 3d Generation – AWESOME! Received my unit yesterday – but due to work obligations (work, yes!) I had to just leave it in the box. However this new generation is amazing and awesome! Ten minutes out of the box I was printing a test part (keychain fob) and a greeting (Hi!) in PLA. The small keychain fob is the Cubify icon. This new 3d printer has some amazing features. It automatically levels the build plate, and automatically measures the z-height for nozzle clearances. While there is no live feed camera, there is a very useful icon of the part being built shown on the color touch screen (and remotely via the client app). As the build progresses, the icon turns from black and white to green like a progress bar on software installations. 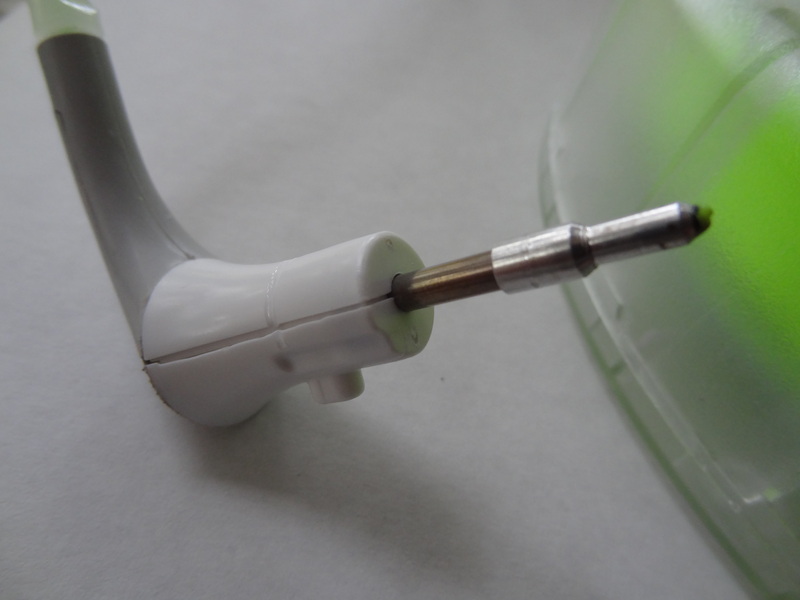 The nozzles are integral to the cartridge so they are replaced with a new one each time you replace a cartridge. Users of Cube 1 and 2 machines will recognize the menu structure of the Cube 3, but now the menu top level scrolls across the screen. Over-the-air firmware updates are now included, so you don’t have to hook it up to your computer for keeping that up to date. The build plate is now aluminum with a white plastic coating. Careful! The coating seems soft but you still use Cube Glue and wow, does it stick! Be patient and soak your part in warm water to soften the bond. And by the way, do that in a non-steel container – the magnets are embedded in the build plate this time and they are strong! I managed to get the build plate stuck in my square metal (iron) cake pan and removing it was not easy. This machine is also quieter than the Cube 2 yet still makes some noise, but the level is nothing objectionable. And the light show it puts on during calibration is quite fascinating. 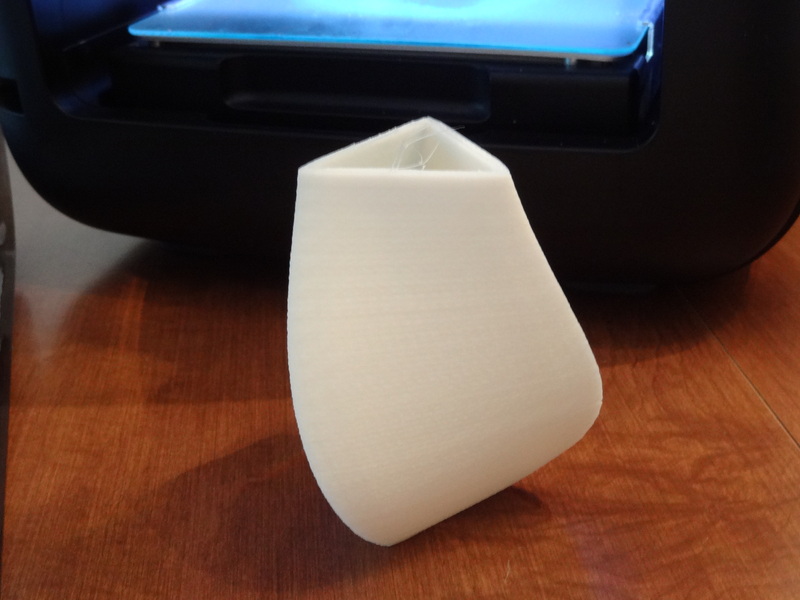 Speed seems fine – a 3″ rook took 6.5 hours at 70 microns. The result was incredible. The layers were barely perceptible. I’ll be updating this in the next few days with some pictures and build samples to show, but based on my first experience, this is definitely the best one out there! 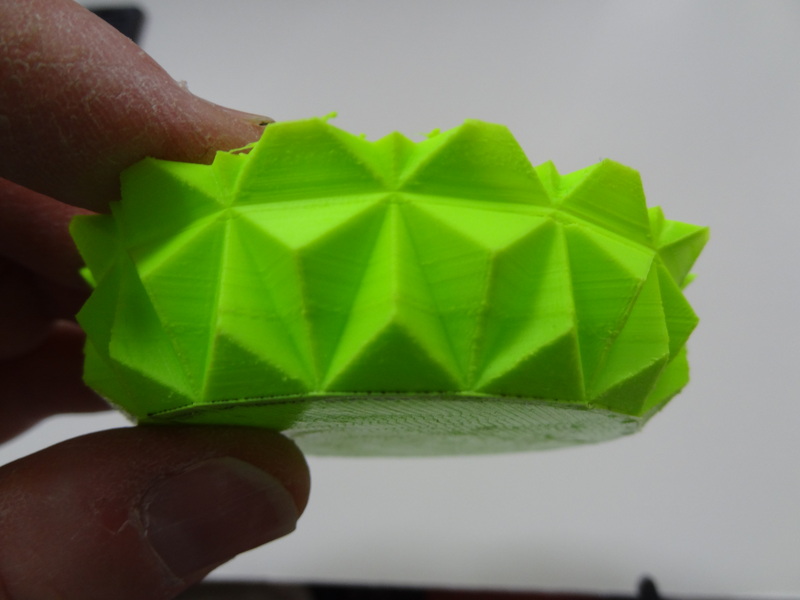 CEL-Robox – Frustrating out of the box – But now much improved! After months past the promised delivery date, my Kickstarter edition of the Robox from CEL arrived this week. Oh wow, what a nice package and level of build! However, my excitement quickly turned to frustration, and now I have what is a cool looking paperweight that has never made a single part. What is wrong? The machine failed to load and purge filament. The cause? The head with its motor that flips nozzles and valves from side to side is dead, or perhaps the drive electronics behind it. It heats up, fan runs, lights come on, etc. but there is no extrusion. There is filament to the head. I’m currently waiting for a response but as it is the weekend already in the UK I don’t expect any help until next week. Will update this if things change, but for now, I’m just using it as a nicely lit (programmable color) paperweight! UPDATE: support finally answered back after the weekend, but it has been slow going. I’ve been running a lot of diagnostics that don’t solve the (obvious) problem of no extrusion – a failed nozzle shuttle motor and/or electronics. I’ve suggested sending back the head for a factory inspection – if it is good (it most probably is not) then a replacement or fix at that end will solve this. If on the off chance it is working with one of their machines, then I’ve got some more detective work to do with the main box. But at least we will have the problem isolated by 50%! UPDATE #2: Sent the head back by air mail to the UK and I’m now waiting for the head to be returned – they quickly checked it on one of their machines and it worked. So the culprit in this case was not the head, but my worry now is that the main board is at fault. They are sending me some replacement head cables in the hopes that this is the problem. 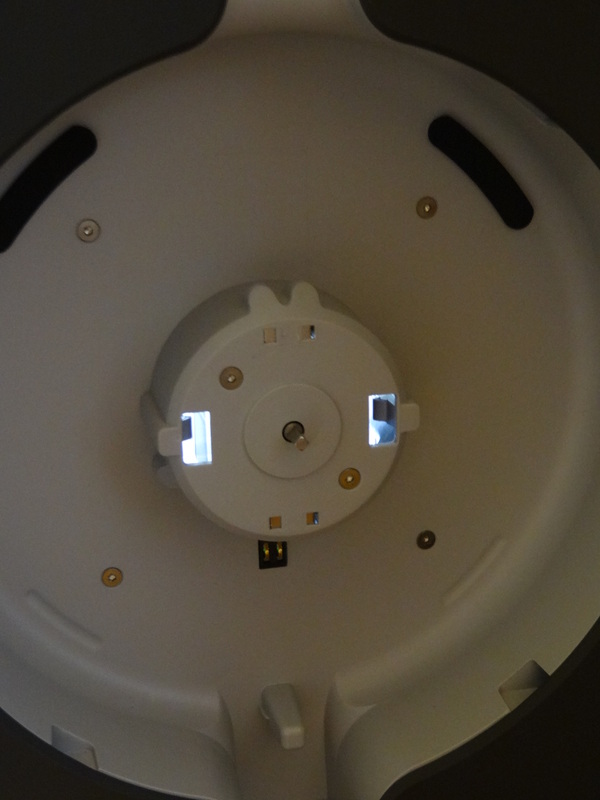 Despite making some rather close inspection of that part of the system, including the connectors at the head shell itself, still this indicates that the problem is with the machine. While I’m pleased with the level of response from their support team, I’m only a little closer to getting this to work. And since I never got any error messages or clues from the system, I’m probably going to go to low-level continuity checks of the wiring to the head to get a resolution. I have already invested 20 hours of debugging time with more to come. I sure would like to get this thing to print! UPDATE #3: The head is back and they sent spare head cables in case something was wrong with the original parts. So I refitted the head and powered it up – connecting the box to my computer again. Of course the first thing I wanted to do was test the head nozzle shift – and I hit the button for a nozzle change and AMAZING — it worked! Thing is, I had never seen this movement before in response to the nozzle change commands. And I didn’t do anything to the electronics before this was returned, other than a firmware update that came while the head was in transit. OK, so it is now on to giving this a try for building a part! UPDATE #4: One more problem – I calibrated the nozzle height according to the instructions, but the head is still too low when it starts a job. The result is a smeared first layer and occasional grinding noises (from filament getting jammed). I’ve opened a support ticket. I’ve not been able to make a single successful print on this machine yet, so despite what appears to be a well-engineered machine, I’m still unable to use it. Sadly, this failure came during a somewhat public demonstration at my college, so it wasn’t a good sell for the product. Well today the Mini finally arrived. 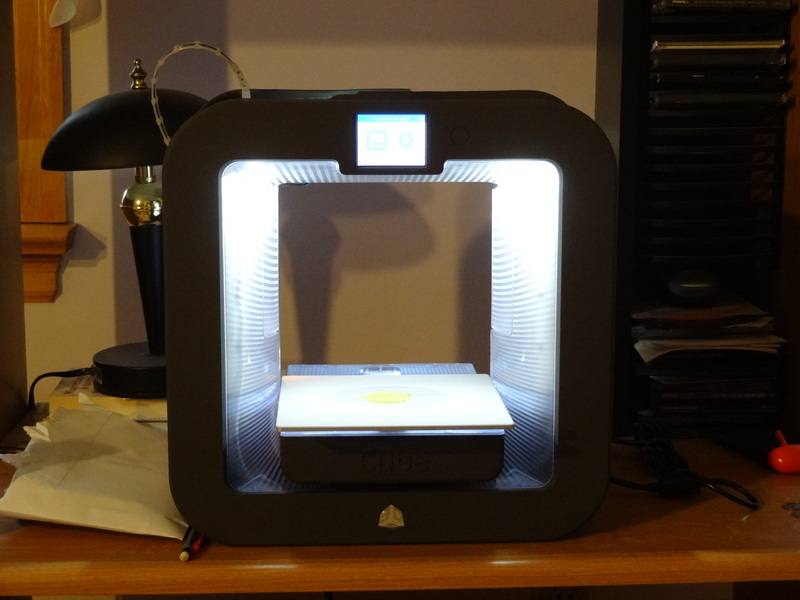 Ordered back in late February, but given the problems of the 5th Generation Replicator, I was in no hurry. I know I got a better engineered Smart Extruder module – one way to tell is if the module has a lot of thin fins in the cooling window (just compare to the pics on the marketing pages for the old style). So I installed MakerBot Desktop 3.1.1 which supposedly has camera and WiFi support, along with the latest firmware for the Mini. Short answer – it doesn’t work. Neither camera nor WiFi works for me and there is no clear explanation. I use WPA2 personal on my router – the WiFi setup procedure seems to work (it sees several WiFi routers in the vicinity), I enter the correct password (no error message after that) but it never shows up on my client list. And as for the camera, nothing there as well. Auto levelling seems to work – but there appears to be a low spot on the right front of the build plate, as even the PLA raft doesn’t stick to it but warps (gosh, it takes a lot to get warped PLA on blue painters’ tape). Something to investigate or maybe send in a support ticket. So my first impression? This is still a work in progress as far as the software goes, and perhaps some details of the hardware too. 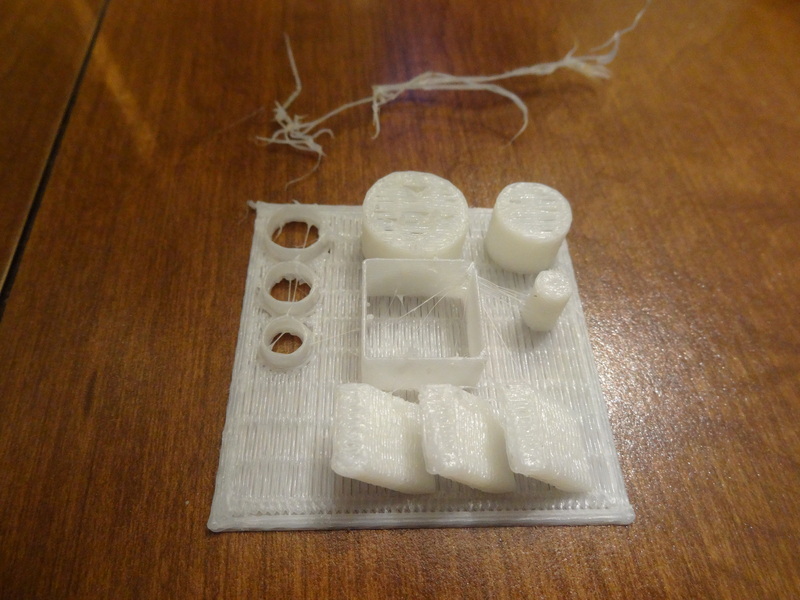 Sorry to say my XYZ Printing DaVinci 1.0 works better at this point and at 40% of the cost. UPDATE: After two firmware updates and one MakerBot Desktop update, I now have a fully functional Mini. And WiFi and remote monitoring now work too. Still, while I like the package, I think the overall price/performance is not great. Why? Rafts: love them, hate them, you can’t turn them off. Or at least not without hacking into the software. Thing is, some parts just don’t need a raft – and PLA sticks well to blue painters tape. Which, in my case, has to be two layers thick or my prints (raft included) warp off of the front of the build plate. Layer height: 200 microns and higher (if you like), but no less. Gosh, this makes small parts. Smaller layer resolution would be nice. BTW the camera is practically worthless – it is more like a slow security cam feed – once every 8 seconds or so it refreshes. I have made some quite acceptable parts despite these shortcomings. However, the competition is at MakerBot’s heels and if they are going to survive they need to ramp up the QC (no more unwitting customer beta testing) and features/price point to make me stay with them.